Just weeks after a massive blast in Tianjin port killed 158 in China, another explosion at a chemical plant killed at least one person, local media reported. The blast occurred Monday night in Dongying city, in the eastern province of Shandong. The explosion occurred at the Diao Kou Xiang Bin Yuan Chemical Co., AFP reported citing a news website run by the local government. The blaze was extinguished about five hours later and "people in charge of the company" were detained by police, the website said. The blast was so massive it could be seen and heard from a great distance. According to People's Daily, the blast happened at around 11:30pm local time (3:30pm GMT). No immediate reports of casualties or damages were available. The plant in Shandong province which caught fire on August 22 produced hundreds of thousands of tons of adiponitrile – a toxic colorless liquid which releases poisonous gases when it reacts with fire, local media reported. 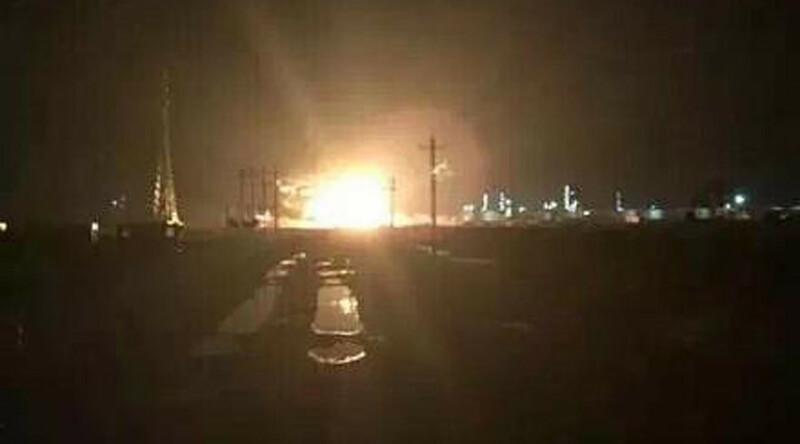 China has been hit by a wave of massive blasts at its chemical facilities this month. Earlier in August, nearly 160 people were killed and around 700 injured in explosions at a warehouse storing hazardous chemicals in Tianjin port. Fifiteen people still remain missing following the tragedy, authorities said on Monday. Cleanup crews are still struggling with cyanide contamination in the area.